Yes, i know i said i would talk more about pool safety and how to keep your family safe near the swimming area, and i will because it is a very important topic, but something amazing came up that i just can't keep to myself anymore!!! 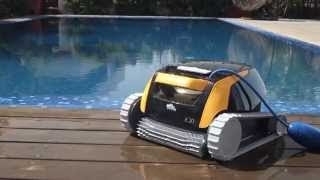 The NEW Dolphin E20 Robotic Pool Cleaner will be in our shop by the end of Aug 2015!! The Dolphin range from Maytronics and Waterwell Pro is of exceptional quality with easy to clean ultra fine filter baskets and the E20 only weighs 6,5kg. Easy for anyone to use. They safe you money and time. Industry-leading energy efficiency and weekly timer with a 2 hour cycle time and a 15 meter cable length, the E20 cleans the pool floor and walls leaving your pool sparkling and ready to use. As you know Maytronics specializes in robotic cleaners and you can also find the M5 Liberty, Supreme M5, Supreme M3, and Bio Suction for Koi ponds and water features at your local Supreme dealer like Elene's Pools in Centurion. "Bringing together over 30 years of expertise in automated pool cleaning, every Dolphin robot combines advanced cleaning technologies with proven reliability to ensure maximum satisfaction, every time." Visit your nearest Elene's Pools Supreme dealer and ask for a FREE demo. And now as i promised....pool safety. Read my next blog please. Thank you for reading about the Dolphin.